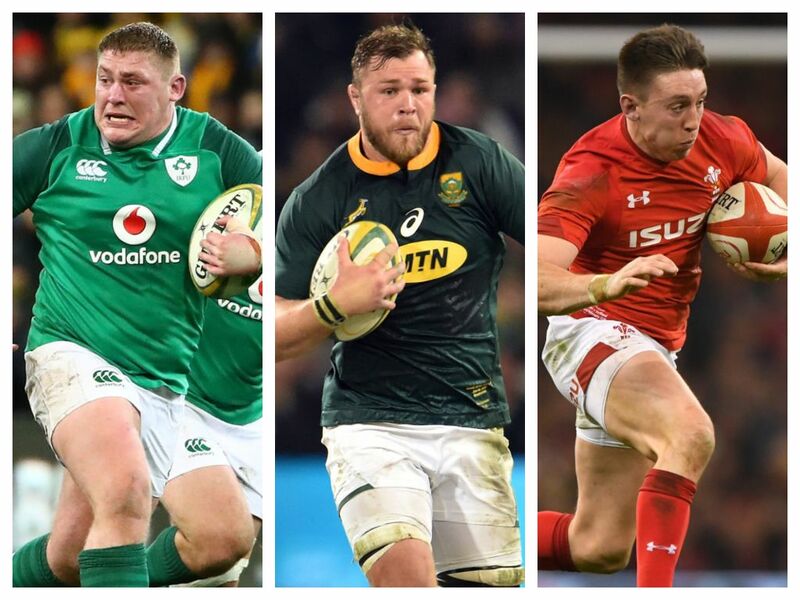 With the first full round of June internationals now a thing of the past, we take a look at which players shone over the weekend. Ireland have the most representatives with four but there is a relatively even spread after South Africa, USA, Fiji, Italy and Wales all picked up fine victories. 15 Rob Kearney (Ireland): After an injury-plagued season, this was perhaps Kearney’s strongest showing since making his comeback from a bicep injury which required surgery back in April. The experienced full-back was among his side’s top carriers with 12, only second to Tadhg Furlong and Garry Ringrose, who had 13 each. Kearney also beat four defenders and made 60 metres while he was solid under the high ball. Edges out Wales’ Hallam Amos, who scored a fantastic try against Argentina, and Japan’s Kotaro Matshushima, who also chipped in with a late try. 14 Josh Adams (Wales): It will take some time forgetting that magnificent solo effort midway through the first half as he picked up a loose ball and stepped his way past a host of los Pumas defenders. Adams made 73 metres from his six carries with four tackle busts on the day. The Worcester Warriors wing is in the form of his life, having finished the season as the Premiership’s joint top try-scorer. Beats out Blair Kinghorn, who impressed against the USA but was ultimately unable to secure victory for his side with a late miss from the tee, as well as England’s Jonny May. 13 Semi Radradra (Fiji): Having just been involved with the Fiji Sevens side, Radradra looks fitter, stronger and more terrifying to defend against every time he plays. He broke the line with ease on Saturday against Georgia, creating Henry Seniloli’s try and then deservedly getting on the try column himself in the 83rd minute. He faced stiff competition from the All Blacks’ Anton Lienert-Brown, Ireland’s Garry Ringrose and Wallabies’ Samu Kerevi, but the Islander ultimately proved too good. 12 Damian de Allende (South Africa): Although he lost the ball in contact on two occasions and still has a problem with that, it was an otherwise brilliant carrying performance from the Stormers centre, who made 16 incursions for 113 metres and beat six defenders in the process. Instrumental in getting the Boks over the advantage line and deserves his spot in the side at the moment after putting his hand up in this series. Meanwhile, the USA’s Paul Lasike and Wallabies’ Kurtley Beale shone for their respective sides. 11 Matteo Minozzi (Italy): Aphiwe Dyantyi was excellent for the Springboks in their series-clinching triumph over England, while Ireland’s Keith Earls and the All Blacks’ Rieko Ioane deserve mentions for their impressive performances but, in the end, the left wing position goes to the Italian speedster. Minozzi was heavily involved as a creator and attacker, making five tackle-busts as well as four offloads from 12 carries. Also impressive was the fact he racked up 81 metres with ball in hand. 10 AJ MacGinty (USA): The fly-half has enjoyed a fine season in the English Premiership with Sale Sharks and he has taken that form into June. MacGinty was outstanding against Scotland as the Eagles recorded a landmark victory – their first ever tier one win. The 28-year-old was typically accurate off the tee, scoring 15 points, and he also set up the decisive try for Hanco Germishuys, in a performance which saw him fend off competition from Ireland’s Johnny Sexton. 9 Henry Seniloli (Fiji): A tough one here with not too many particularly standing out. South Africa’s Faf de Klerk was once again excellent but not quite as imperious as the previous week, while France’s Morgan Parra and Tonga’s Sonatane Takulua also put in good shifts. We’ve therefore gone for Seniloli, who showed a poacher’s instinct for the first try, before he combined well with Semi Radradra to score a second as the Islanders claimed a fourth consecutive Pacific Nations Cup. 8 Duane Vermeulen (South Africa): Another magnificent display from the big number eight, who once again caused England endless problems, whether at the breakdown or in open play. He didn’t quite get the number of turnovers as the previous week, but he constantly slowed down the opposition ball and was more of a threat in the loose this week. In total, the Springbok back-row ran for 46 metres, beat six defenders and made two clean breaks, which included a superbly taken try. Anton Rudoi (Russia) scored a hat-trick against Canada and France’s Kevin Gourdon played well, but no one realistically got close to Vermeulen’s levels. 7 Jake Polledri (Italy): Two starts, two barnstorming displays for the Azzurri, it is easy to see why the gargantuan flanker is highly-rated. After his impressive outing against Scotland in the Six Nations, Polledri followed that up by making another big impact in helping Italy level the series against Japan. He scored an excellent individual try, ran for 36 metres in total and was equally as effective in defence, making 10 tackles. Elsewhere, James Davies produced another outstanding performance for Wales in Argentina. 6 Peter O’Mahony (Ireland): An easy selection this one, despite Mathieu Babillot’s performance in what was a mightily effective French back-row. The Ireland blindside arguably out-Pococked the Australian fetcher with a magnificent effort at the breakdown. O’Mahony was a constant thorn at the contact area and was typically adept at the lineout, while the Munster flanker also showed some neat touches in open play, something O’Mahony had bizarrely been criticised for in the past, despite all the other qualities he brings. 5 James Ryan (Ireland): The Six Nations champions’ forwards deserve plenty of credit for laying a solid platform for their backs in their win against Australia in Melbourne and Ryan was at the forefront of that effort with a busy showing at the coalface. Shone in the lineouts and was a willing ball carrier but was particularly impressive on defence with 11 tackles. 4 Guido Petti (Argentina): Although los Pumas suffered another defeat to Wales, Petti was one of his side’s best players on the day and caught the eye with a fine showing. The 23-year-old did his bit with ball in hand and finished with 29 metres gained from a clean break, three defenders beaten and also managed a try assist. Comes in ahead of Ireland veteran Devin Toner. 3 Tadhg Furlong (Ireland): The Leinsterman showed why he is widely regarded as the best tighthead prop in the world at the moment with a brilliant all-round performance in his team’s victory against the Wallabies. Furlong delivered a superb scrummaging display but also did well as a ball carrier, gaining 43 metres from 13 carries which included one memorable break, six defenders beaten and he was rewarded with his first Test try for his efforts. 2 Joe Taufete’e (USA): The 25-year-old was one of his side’s heroes in a memorable win over Scotland in Houston and finished with a brace of tries scored either side of half-time. Eventually finished with 26 metres gained with seven defenders beaten but also put his body on the line on defence with nine hits. Elsewhere, Bongi Mbonambi also delivered a busy shift for South Africa against England. 1 Steven Kitshoff (South Africa): He had big shoes to fill when he came on as a second half replacement for Test centurion Tendai Mtawarira but Kitshoff’s introduction proved to be a masterstroke from Bok boss Rassie Erasmus. The Stormers stalwart was dominant in the scrums and his demolition of Kyle Sinckler at the set-piece set up a penalty try for his side. Also gained momentum on attack and beats out New Zealand’s Joe Moody.